There are a thousand #feels that Pinoy K-drama fans share, and one of them is finding themselves in situations that are quite embarrassing. Everyone’s had their fair share of stares from strangers while commuting, various reactions from siblings and parents, and so many ugly-cry moments. They owe it all to the characters they’ve gotten obsessed in the series they just Can’t. Stop. Watching. 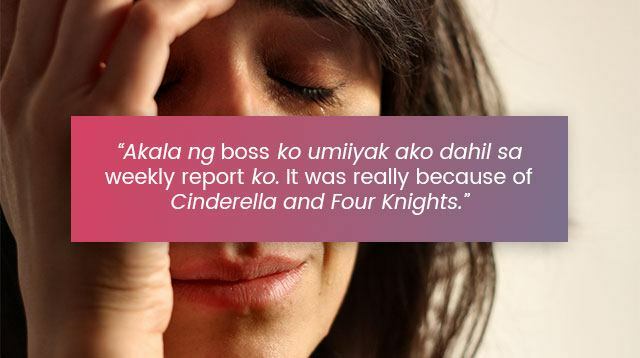 Can you relate to these K-drama fans who shared their stories and also describe yourself with the term, "nilamon ng sistema?" LOL! “A girl sat beside me on the MRT. It was a bit tight, so she was partially seated on the edge. She settled in anyway, and then proceeded to take out her phone to watch something. As I glanced over, I thought I saw something familiar. I looked longer than I should, waiting for that moment of recognition. And then the scene changed and Rain showed up. It was Full House. “Two weeks ago. I was heading to PUP to pass a financial report. I forgot my bluetooth earphones, so I used my old earphones. I was re-watching episodes of Strong Woman Do Bong Soon. If you know Park Bo Young, playing the role of Do Bong Soon, you’ll know the sound of her voice. Sometimes, it sounds like a moan, especially when she is doing her pa-cute laugh or when she acts clueless. So I was watching, feel na feel ko pa, nilakasan ko pa volume. Then, ‘di ko alam na sira pala 'yung earphones ko—habang may naririnig sa earphones, may naririnig din sa speakers ng phone. Then comes this moaning-like sound of Do Bong Soon. What’s your most embarrassing K-drama fan moment?